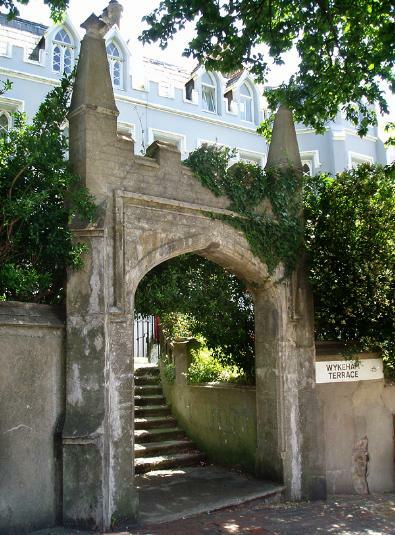 Wykeham Terrace is the grey and white composition at the very bottom of Dyke Road, just below St. Nicholas Church. It was built early in the Nineteenth Century in a Regency Gothic style by an architect whose identity, unfortunately, is uncertain. I have my suspicions though. There’s little else similar in Brighton to which one might compare it. 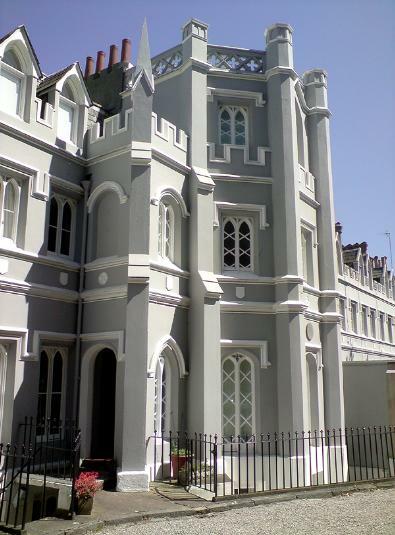 Gothic House, opposite Waitrose on Western Road, is perhaps its nearest equivalent. Upon seeing the interior of No. 1, it was immediately clear why one might want to investigate further. From the original layout of the basement to the uniqueness of the roof terrace, little is obvious. The differences between the thirteen houses and, indeed, between the lower (Numbers 1-6) and upper (Number 7-12) sections can be explained by previous uses. There is, in fact, no No. 13; instead a No. 7a. Various houses were used as a home for prostitutes and the Territorial Army later became involved, selling off the upper section to a conscientious developer who carried out the restoration. It has since had more than its fair share of interesting residents with Sir Roy Strong, Adam Faith, Dame Flora Robson and various squatters all living there at some point. With regards to the upper section, a limited company is in place to deal with maintenance issues as is a rule stating that that none of the houses may be turned into flats. The lower section, now separated by a large wall. is a different story. There is presently no maintenance of the gardens and the grand front boundary wall is in urgent need of attention. The plan should be – must be – to follow the limited company arrangement and start applying for grants. There’s always so much to do. The latest battle is with Brighton & Hove City Council in the form of a historic street sign being replaced with a tacky plastic equivalent. There also exists a scale model of the Terrace in the Council’s possession. I requested a viewing some months back but have been told that it won’t be possible until after March!